« Trip Barker Open Alpha Android App Now Available! Register with Trip Barker and enlist your Mobile Phone Number. Only registered phone numbers can do an Trip Plan request via SMS. Within a few seconds, Trip Barker will reply to you with one or more SMS messages outlining the route you need to take! This SMS Trip Planing Service is designed to be an ’emergency’ option for Trip Barker commuters who are in need of assistance in their commute but have no other means of accessing Trip Barker. Future expansion of this service includes text announcements from Trip Barker partners and sponsors as well as queries for other information such as Traffic or Weather updates. Join the Trip Barker Commuter Community Today and help make commuting FUN! 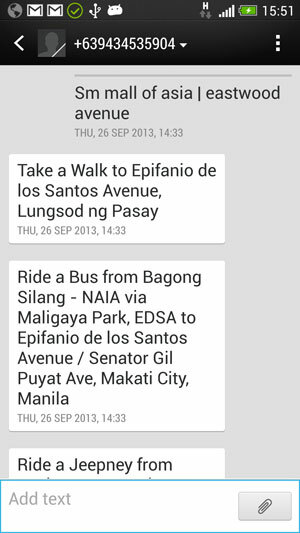 Tagged gtfs philippines, sms philippines, sms transit planner, sms trip planner, transit planner philippines, trip planner philippines. Bookmark the permalink.